I've settled down again! 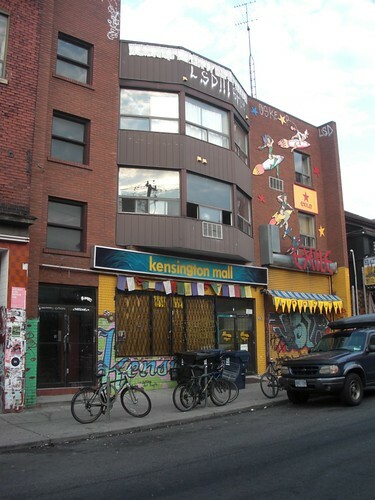 I just rented a room in Kensington Market, a hip shopping area in Toronto, Ontario Canada. My room is immediately beneath the big "LSD!!!!" graffiti :-). Yesterday I bought some good sharp cheddar at the cheese shop, some salami at the meat market, and an awesome loaf of bread at the baker: all the makings of a great sandwich. Those who know me well know how much I love sandwiches! I'm also about a 45 second walk from hacklab.to, one of the hackerspaces here in Toronto. My room actually has a view of the CN tower! I'm looking forward to settling in and getting to know the area. I plan to print out a huge map of the area and pencil on all of the nearby restaurants and shops, then check them off one at a time as I visit them :-). Coming soon: I will blog about my trip to Ireland. I visited two hackerspaces, TOG and 091Labs.